Marco Arment is a well known and somewhat prolific software developer for iOS. His first iOS app Instapaper went on to become incredibly successful, as did The Magazine not just for the app but for all the clones it inspired. Some lesser known apps along the way include BugShot and Nursing Clock (No longer available) which didn’t do so well but these show the theme that he follows: Ask what problem you face and write an app to solve that problem1. With all that behind him Arment has turned his attention to Podcast playback apps as one of his other (current) passions and developed Overcast. [App Store Link] It’s been in development for a while and was pre-announced back in September, 2013 at the XOXO conference. With Arments history of success and a long lead-up to todays release, it’s inevitable that those interested members of the community have very big expectations for Overcast. The reality is it’s a podcast playback app and should be judged on its performance at that specific task. 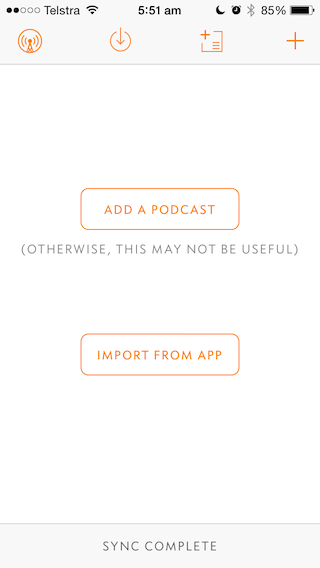 If you’re into feature comparisons and tick sheets then I doubt you’ll find Overcast immediately compelling and that’s a shame because I’ve always felt that podcast players fit into two categories = Too simple and way too complicated. Overcast strikes an interesting balance and lies somewhere in-between. Overcast enters a much more mature space with stiff competition from well-established podcast apps such as Pocket Casts, Castro, Instacast, Downcast, PodWrangler and Apples own Podcasts app just to name a few. A fact Arment acknowledges in the About screen suggesting that if Overcast isn’t for you then you should support other independent developers which is a nice sentiment. That said in order to be a useful addition to the current crop of podcast apps Overcast has to at least cover off the main features of the other apps currently in the space as well as add something(s) the others don’t. Whether it does or doesn’t will depend upon your own personal needs and drivers in a podcast app however I’ve been fortunate to be Beta testing Overcast for months so I can hopefully give you some idea of where Overcast is different. Why Use A Podcast App At All? Podcast playing apps are essentially specialised RSS ‘readers’ however since audio is handled differently to text2 that leads to a different subset of optimisations. Recently a group of Twitter friends were discussing RSS going away entirely for podcasts at some point with an optimised podcast-specific format with all network-streaming and built-in browser support cross-platform; however until (if) that happens podcast apps in their current form are a necessity for those of us that enjoy our podcasts and listen to them at least as much if not more than we do music. Both Downcast and Instacast start with a modal dialogue box (two for Instacast) before diving into their main screens whilst Castro simply lands you on your main screen to let you figure it out for yourself. 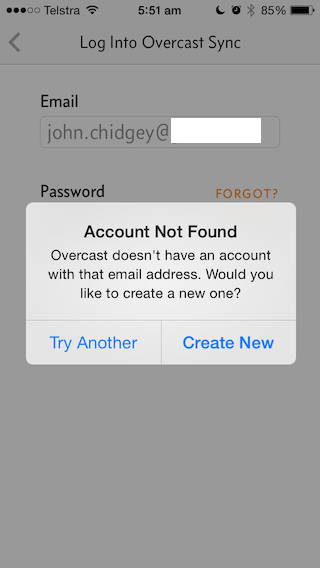 Overcast instead has a custom initial screen that reassures the user why Sync accounts aren’t such scary things. Sync support has become a staple of podcast apps in recent times (noting Castro as one exception) so Overcast must support it but for me personally I don’t use it as I almost always listen to my podcasts on my iPhone so there’s nothing to sync with. The other arguement for sync relates to restoring or buying a new device which for me doesn’t happen very often at all. Irrespective Overcast at least takes time to explain why sync is helpful whilst the other big names I tested didn’t really bother to put it front and center, if at all. Then again since it’s impossible to use Overcast without an account set up, such explanations could be considered a necessity. 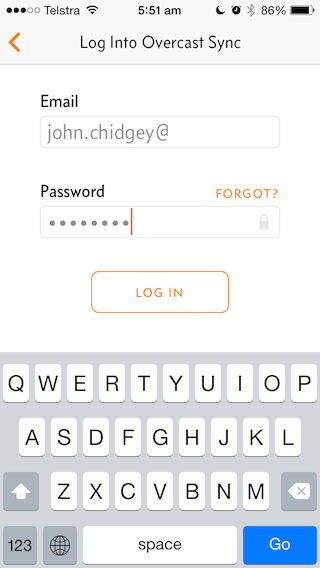 You’re presented with this front and center once you’ve either logged in or created your new account. 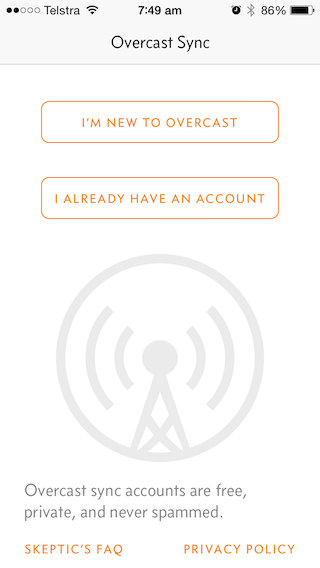 It’s possible to Add from a URL (of course) but Overcast maintains its own internal list of podcasts and like Pocket Casts it supports server-side sync. 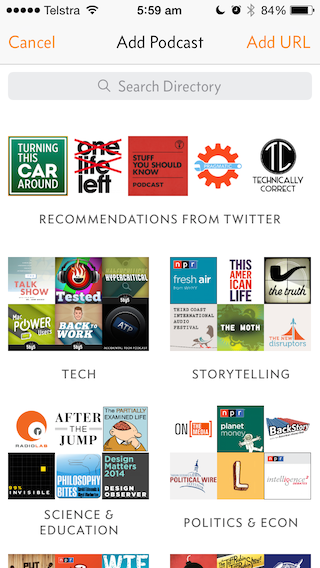 The Add Podcast page is well laid out with multiple groups of six thumbnails based on category to aid your discovery of new podcasts. 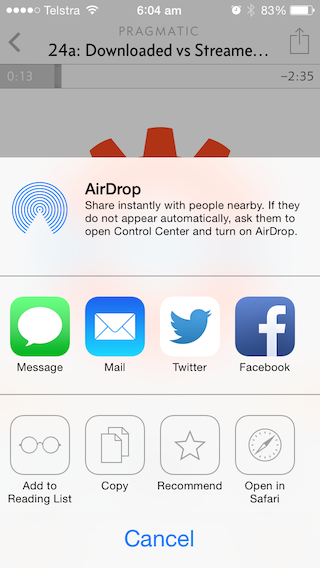 A lot of people rave about Downcast and how it handles priority podcasts and playlists. For me that’s not a big issue as I tend to change my mind a lot and most of the podcasts I listen to are longer than my commuting time making playlists unnecessary. That said, a lot of other people listen to podcasts in playlists when driving on long trips, long flights, doing housework or even during work hours and want to set and forget. Fortunately Overcast can organise playlists by their play status (New/in progress, In progress only & Deleted only), selected podcasts (or except those selected), priority podcasts, Oldest to Newest (and vice-versa, individual episodes or by podcast), plus add or exclude specific episodes from that playlist. Both Downcast and Pocket Casts (Episode Filters) do good jobs on playlist management as well however I find Overcasts to be more intuitive on the whole. When listening to a podcast either on a playlist or if there’s a list of episodes of a podcast with some still unlistened you can opt to listen back “One by One” (IAP) or “Continuous Play” which is nice to have as an override however I can forsee some people forgetting the One by One feature is on and when the next episode doesn’t queue up shaking their fist briefly. That said, that issue isn’t unique to Overcast. 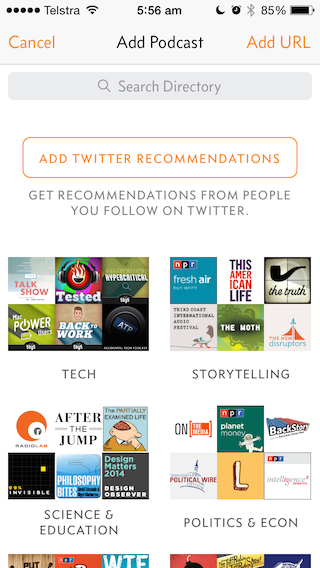 Twitter Recommendations: A great discovery feature in Overcast requires you to link your Twitter account (assuming you have one) and once you’ve signed in the recommendations are pulled from those you follow on the selected Twitter account and displayed in a group of five thumbnails at the top. The recommendations themselves are for individual episodes and the list shows who recommended them and is broken down into recommended episodes that can be individually downloaded and a section for podcasts you might like which can be subscribed to. 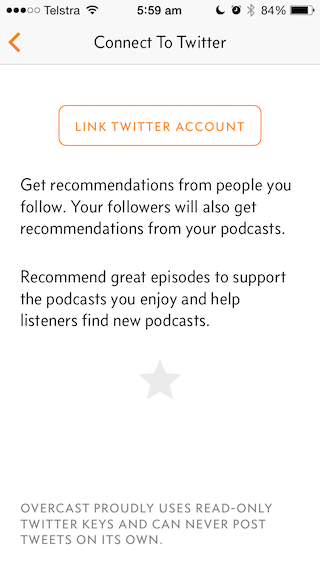 It is possible to recommend an episode from within Overcast either on the sharing sheet or the star directly on the episode information screen but not a podcast in its entirety. This recommendation information however is kept within Overcast and nothing is posted to Twitter unless you specifically share to Twitter via the Share Sheet. Smart Speed: This is an interesting feature that I didn’t realise I wanted to have until I had it. In audio editing applications there is often an option to “Strip Silences” out of the audio track. This is designed to remove the natural pauses people make as they draw their next breath between words and sentances. If this is done it can make the audio sound disjointed and unnatural depending upon the settings used but more importantly it’s up to the audio technician/editor that’s working on the podcast production to decide whether to do it and with what settings. Arments approach hands control of silence stripping to the user. Technically how he’s done it is beyond the scope of this review but however he has, it’s done exceedingly well. To drive the point home on the Settings page a counter shows just how many minutes you’ve saved by using the feature. It’s so effective that most of the time you don’t even notice it’s on. Effects: The volume boost is good for podcasts that have been poorly edited or recorded under less than ideal circumstances I found, but generally I leave it off because I don’t need it to listen to the podcasts I do. It does effectively boost the audio as the name suggests. The playback speed can be adjusted between 0.75x and 2.5x (roughly) which Arment made a good point about being ‘actual’ speeds during development. The best part of these effects though is the ability to set those effects either globally or by individual podcast. Each week most podcasts have the same hosts under similar recording conditions hence it’s often the case that the hosts speak very quickly or not so fast with either a faint or loud recording setup making optimising the playback speed and boost on a podcast by podcast basis very handy. Seek Acceleration: There’s also an option to increase the acceleration between seeks when the button is repeatedly pressed such that on the 4th seek forward (also works for consecutive rewinds) the seek duration you’ve selected is increased by 50%, on the 5th seek by 125%, then 237.5% then a maximum of 500% of the seek duration provided your selections are not greater than 1 second in-between. It took me a bit to get the hang of this feature but once I did it turned out to be quite useful. Selective Subscriptions: It’s possible to subscribe only to the episodes you want when adding the podcast to your feed as you can opt not to subscribe to all new episodes and if you do subsrcibe to all new episodes you can choose to be notified when new episodes are available and choose to keep 1, 2, 3, 5, 10 or All Unplayed episodes. This is wonderful for trying out new shows that you’re not yet sold on. Technically some of the other popular podcast apps support this through different mechanisms however the implementation in Overcast is the only one that actually makes sense to me in how it works. Web Interface: Also becoming the next standard of sorts is a web interface for those podcast apps that offer accounts and syncing like Podfy. Overcast currently shows a list of your currently active episodes and selecting an episode takes you to a page with an embedded web player and various sharing options including the option to share a timestamp link like the one I implemented myself recently on this site4. Knowing Arments penchant for PHP and server side features I expect the web interface will become much more powerful as time progresses but as it stands today it’s useful to have. I can see myself using from time to time even though it won’t be a staple part of my daily usage I can see the future potential although nothing has been officially announced. The biggest issue I can see is the lack of streaming support. Of course you can still flick the switch (to allow cellular downloads when you away from WiFi) and download episodes on the go but they will download in their entirety, rather than just stream the pieces they are about to play. Arment assured me this will be coming very soon with iOS8 and whilst I never stream, there are plenty of people that do and for them it may be a deal-breaker. (Albeit only for a few months) If that’s you, you won’t be waiting long. If you’re a stickler for this sort of thing then you’ll also appreciate the attention to detail of the layout and font choices: all very pleasing to the eye. Castro also has this going for it putting Overcast and Castro out on their own ahead of the others in this respect at least. Overcast has become my primary podcast client of choice for several months now. I’ve been gravitated towards the Smart Speed and intuitive controls and found myself becoming mildly annoyed when going back to the other podcast apps when putting this review together. Arment has managed to move the bar another notch higher with Overcast whilst simultaneously lowering the barrier of entry for relative newcomers to the medium with a smoother interface, better podcast discoverability and it Turns OutTM Smart Speed is a pretty neat feature and now I can’t listen without it. For those that love the simplicity of Castro but want something a bit more fully featured but still easy to use, then Overcast demands serious consideration.